Territory held by Israel before and after the Six-Day War. The Straits of Tiran are circled, between the Gulf of Aqaba to the north and the Red Sea to the south. Relations between Israel and its neighbours were not fully normalised after the 1948 Arab–Israeli War. In 1956 Israel invaded the Sinai peninsula in Egypt, with one of its objectives being the reopening of the Straits of Tiran that Egypt had blocked to Israeli shipping since 1950. Israel was eventually forced to withdraw, but was guaranteed that the Straits of Tiran would remain open. A United Nations Emergency Force was deployed along the border, but there was no demilitarisation agreement. In the months prior to June 1967, tensions became dangerously heightened. Israel reiterated its post-1956 position that the closure of the Straits of Tiran to Israeli shipping would be a cause for war (a casus belli). In May Egyptian President Gamal Abdel Nasser announced that the straits would be closed to Israeli vessels and then mobilised its Egyptian forces along its border with Israel. On 5 June, Israel launched what it claimed were a series of preemptive airstrikes against Egyptian airfields. Which side caused the war is one of a number of controversies relating to the conflict. The Egyptians were caught by surprise, and nearly the entire Egyptian air force was destroyed with few Israeli losses, giving the Israelis air supremacy. Simultaneously, the Israelis launched a ground offensive into the Gaza Strip and the Sinai, which again caught the Egyptians by surprise. After some initial resistance, Nasser ordered the evacuation of the Sinai. Israeli forces rushed westward in pursuit of the Egyptians, inflicted heavy losses, and conquered the Sinai. Jordan had entered into a defense pact with Egypt a week before the war began; the agreement envisaged that in the event of war Jordan would not take an offensive role but would attempt to tie down Israeli forces to prevent them making territorial gains. About an hour after the Israeli air attack, the Egyptian commander of the Jordanian army was ordered by Cairo to begin attacks on Israel; in the initially confused situation, the Jordanians were told that Egypt had repelled the Israeli air strikes. Israel subsequently captured and occupied the West Bank, including East Jerusalem, from the Jordanians and the Golan Heights from Syria. Egypt and Jordan agreed to a ceasefire on 8 June, and Syria agreed on 9 June; a ceasefire was signed with Israel on 11 June. In the aftermath of the war, Israel had crippled the Egyptian, Syrian and Jordanian militaries, having killed over 20,000 troops while only losing fewer than 1,000 of its own. The Israeli success was the result of a well-prepared and enacted strategy, the poor leadership of the Arab states, and their poor military leadership and strategy. Israel seized the Gaza Strip and the Sinai Peninsula from Egypt, the West Bank, including East Jerusalem, from Jordan and the Golan Heights from Syria. Israel's international standing greatly improved in the following years. Its victory humiliated Egypt, Jordan and Syria, leading Nasser to resign in shame; he was later reinstated after protests in Egypt against his resignation. The speed and ease of Israel's victory would later lead to a dangerous overconfidence within the ranks of the Israel Defense Forces (IDF), contributing to initial Arab successes in the subsequent 1973 Yom Kippur War, although ultimately Israeli forces were successful and defeated the Arab militaries. The displacement of civilian populations resulting from the war would have long-term consequences, as 300,000 Palestinians fled the West Bank and about 100,000 Syrians left the Golan Heights. Across the Arab world, Jewish minority communities fled or were expelled, with refugees going mainly to Israel or Europe. On 22 May 1967, President Nasser addressed his pilots at Bir Gifgafa Airfield in Sinai: "The Jews are threatening war – we say to them ahlan wa-sahlan (welcome)!" After the 1956 Suez Crisis, Egypt agreed to the stationing of a United Nations Emergency Force (UNEF) in the Sinai to ensure all parties would comply with the 1949 Armistice Agreements. In the following years there were numerous minor border clashes between Israel and its Arab neighbors, particularly Syria. In early November 1966, Syria signed a mutual defense agreement with Egypt. Soon after this, in response to Palestine Liberation Organisation (PLO) guerilla activity, including a mine attack that left three dead, the Israeli Defence Force (IDF) attacked the village of as-Samu in the Jordanian-occupied West Bank. Jordanian units that engaged the Israelis were quickly beaten back. King Hussein of Jordan criticized Egyptian President Gamal Abdel Nasser for failing to come to Jordan's aid, and "hiding behind UNEF skirts". If a single act of folly was more responsible for this explosion than any other, it was the arbitrary and dangerous announced decision that the Straits of Tiran would be closed. The right of innocent, maritime passage must be preserved for all nations. On 30 May, Jordan and Egypt signed a defense pact. The following day, at Jordan's invitation, the Iraqi army began deploying troops and armoured units in Jordan. They were later reinforced by an Egyptian contingent. On 1 June, Israel formed a National Unity Government by widening its cabinet, and on 4 June the decision was made to go to war. The next morning, Israel launched Operation Focus, a large-scale surprise air strike that was the opening of the Six-Day War. James Reston, writing in The New York Times on 23 May 1967, noted, "In discipline, training, morale, equipment and general competence his [Nasser's] army and the other Arab forces, without the direct assistance of the Soviet Union, are no match for the Israelis. ... Even with 50,000 troops and the best of his generals and air force in Yemen, he has not been able to work his way in that small and primitive country, and even his effort to help the Congo rebels was a flop." Against Jordan's forces on the West Bank, Israel deployed about 40,000 troops and 200 tanks (eight brigades). Israeli Central Command forces consisted of five brigades. The first two were permanently stationed near Jerusalem and were the Jerusalem Brigade and the mechanized Harel Brigade. Mordechai Gur's 55th Paratroopers Brigade was summoned from the Sinai front. The 10th Armored Brigade was stationed north of the West Bank. The Israeli Northern Command comprised a division of three brigades led by Major General Elad Peled which was stationed in the Jezreel Valley to the north of the West Bank. On the eve of the war, Egypt massed approximately 100,000 of its 160,000 troops in the Sinai, including all seven of its divisions (four infantry, two armoured and one mechanized), four independent infantry brigades and four independent armoured brigades. Over a third of these soldiers were veterans of Egypt's continuing intervention into the North Yemen Civil War and another third were reservists. These forces had 950 tanks, 1,100 APCs, and more than 1,000 artillery pieces. Syria's army had a total strength of 75,000 and was deployed along the border with Israel. Professor David W. Lesch wrote that "One would be hard-pressed to find a military less prepared for war with a clearly superior foe", since Syria’s army had been decimated in the months and years prior through coups and attempted coups that had resulted in a series of purges, fracturings and uprisings within the armed forces. The Jordanian Armed Forces included 11 brigades, totalling 55,000 troops. Nine brigades (45,000 troops, 270 tanks, 200 artillery pieces) were deployed in the West Bank, including the elite armoured 40th, and two in the Jordan Valley. They possessed sizable numbers of M113 APCs and were equipped with some 300 modern Western tanks, 250 of which were U.S. M48 Pattons. They also had 12 battalions of artillery, six batteries of 81 mm and 120 mm mortars, a paratrooper battalion trained in the new U.S.-built school and a new battalion of mechanized infantry. The Jordanian Army, then known as the Arab Legion, was a long-term-service, professional army, relatively well-equipped and well-trained. Israeli post-war briefings said that the Jordanian staff acted professionally, but was always left "half a step" behind by the Israeli moves. The small Royal Jordanian Air Force consisted of only 24 British-made Hawker Hunter fighters, six transports, and two helicopters. According to the Israelis, the Hawker Hunter was essentially on par with the French-built Dassault Mirage III – the IAF's best plane. 100 Iraqi tanks and an infantry division were readied near the Jordanian border. Two squadrons of Iraqi fighter-aircraft, Hawker Hunters and MiG 21s, were rebased adjacent to the Jordanian border. The Arab air forces were reinforced by some aircraft from Libya, Algeria, Morocco, Kuwait, and Saudi Arabia to make up for the massive losses suffered on the first day of the war. They were also aided by volunteer pilots from the Pakistan Air Force acting in an independent capacity. PAF pilots shot down several Israeli planes. Egypt had by far the largest and the most modern of all the Arab air forces, consisting of about 420 combat aircraft, all of them Soviet-built and with a heavy quota of top-of-the-line MiG-21s. Of particular concern to the Israelis were the 30 Tu-16 "Badger" medium bombers, capable of inflicting heavy damage on Israeli military and civilian centers. Israeli weapons were mainly of Western origin. Its air force was composed principally of French aircraft, while its armoured units were mostly of British and American design and manufacture. Some infantry weapons, including the ubiquitous Uzi, were of Israeli origin. Egypt, Syria and Iraq used T-34/85, T-54, T-55, PT-76, and SU-100/152 World War II-vintage self-propelled guns. Jordan used M-47, M-48, and M-48A1 Patton tanks. Panzer IV (used by Syria) M50 and M51 Shermans, M48A3 Patton, Centurion, AMX-13. The Centurion was upgraded with the British 105 mm L7 gun prior to the war. The Sherman also underwent extensive modifications including a larger 105 mm medium velocity, French gun, redesigned turret, wider tracks, more armour, and upgraded engine and suspension. The first and most critical move of the conflict was a surprise Israeli attack on the Egyptian Air Force. Initially, both Egypt and Israel announced that they had been attacked by the other country. On 5 June at 7:45 Israeli time, as civil defense sirens sounded all over Israel, the IAF launched Operation Focus (Moked). All but 12 of its nearly 200 operational jets launched a mass attack against Egypt's airfields. The Egyptian defensive infrastructure was extremely poor, and no airfields were yet equipped with hardened aircraft shelters capable of protecting Egypt's warplanes. Most of the Israeli warplanes headed out over the Mediterranean Sea, flying low to avoid radar detection, before turning toward Egypt. Others flew over the Red Sea. The attack guaranteed Israeli air supremacy for the rest of the war. Attacks on other Arab air forces by Israel took place later in the day as hostilities broke out on other fronts. On 5 June, at 7:50 a.m., the northernmost Israeli division, consisting of three brigades and commanded by Major General Israel Tal, one of Israel's most prominent armour commanders, crossed the border at two points, opposite Nahal Oz and south of Khan Yunis. They advanced swiftly, holding fire to prolong the element of surprise. Tal's forces assaulted the "Rafah Gap", a seven-mile stretch containing the shortest of three main routes through the Sinai towards El-Qantarah el-Sharqiyya and the Suez Canal. The Egyptians had four divisions in the area, backed by minefields, pillboxes, underground bunkers, hidden gun emplacements and trenches. The terrain on either side of the route was impassable. The Israeli plan was to hit the Egyptians at selected key points with concentrated armour. On 5 June, with the road open, Israeli forces continued advancing towards Arish. Already by late afternoon, elements of the 79th Armored Battalion had charged through the seven-mile long Jiradi defile, a narrow pass defended by well-emplaced troops of the Egyptian 112th Infantry Brigade. In fierce fighting, which saw the pass change hands several times, the Israelis charged through the position. 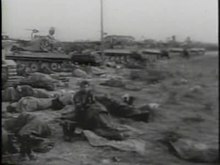 The Egyptians suffered heavy casualties and tank losses, while Israeli losses stood at 66 dead, 93 wounded and 28 tanks. Emerging at the western end, Israeli forces advanced to the outskirts of Arish. As it reached the outskirts of Arish, Tal's division also consolidated its hold on Rafah and Khan Yunis. The following day, 6 June, the Israeli forces on the outskirts of Arish were reinforced by the 7th Brigade, which fought its way through the Jiradi pass. After receiving supplies via an airdrop, the Israelis entered the city and captured the airport at 7:50 am. The Israelis entered the city at 8:00 am. Company commander Yossi Peled recounted that "Al-Arish was totally quiet, desolate. Suddenly, the city turned into a madhouse. Shots came at us from every alley, every corner, every window and house." An IDF record stated that "clearing the city was hard fighting. The Egyptians fired from the rooftops, from balconies and windows. They dropped grenades into our half-tracks and blocked the streets with trucks. Our men threw the grenades back and crushed the trucks with their tanks." Gonen sent additional units to Arish, and the city was eventually taken. Brigadier-General Avraham Yoffe's assignment was to penetrate Sinai south of Tal's forces and north of Sharon's. Yoffe's attack allowed Tal to complete the capture of the Jiradi defile, Khan Yunis. All of them were taken after fierce fighting. Gonen subsequently dispatched a force of tanks, infantry and engineers under Colonel Yisrael Granit to continue down the Mediterranean coast towards the Suez Canal, while a second force led by Gonen himself turned south and captured Bir Lahfan and Jabal Libni. Further south, on 6 June, the Israeli 38th Armored Division under Major-General Ariel Sharon assaulted Um-Katef, a heavily fortified area defended by the Egyptian 2nd Infantry Division under Major-General Sa'adi Nagib, and consisting of some 16,000 troops. The Egyptians also had a battalion of tank destroyers and a tank regiment, formed of Soviet World War II armour, which included 90 T-34-85 tanks, 22 SU-100 tank destroyers, and about 16,000 men. The Israelis had about 14,000 men and 150 post-World War II tanks including the AMX-13, Centurions, and M50 Super Shermans (modified M-4 Sherman tanks). As Sharon's division advanced into the Sinai, Egyptian forces staged successful delaying actions at Tarat Umm, Umm Tarfa, and Hill 181. An Israeli jet was downed by anti-aircraft fire, and Sharon's forces came under heavy shelling as they advanced from the north and west. The Israeli advance, which had to cope with extensive minefields, took a large number of casualties. A column of Israeli tanks managed to penetrate the northern flank of Abu Ageila, and by dusk, all units were in position. The Israelis then brought up ninety 105 mm and 155 mm artillery guns for a preparatory barrage, while civilian buses brought reserve infantrymen under Colonel Yekutiel Adam and helicopters arrived to ferry the paratroopers. These movements were unobserved by the Egyptians, who were preoccupied with Israeli probes against their perimeter. As night fell, the Israeli assault troops lit flashlights, each battalion a different color, to prevent friendly fire incidents. At 10:00 pm, Israeli artillery began a barrage on Um-Katef, firing some 6,000 shells in less than twenty minutes, the most concentrated artillery barrage in Israel's history. Israeli tanks assaulted the northernmost Egyptian defenses and were largely successful, though an entire armoured brigade was stalled by mines, and had only one mine-clearance tank. Israeli infantrymen assaulted the triple line of trenches in the east. To the west, paratroopers commanded by Colonel Danny Matt landed behind Egyptian lines, though half the helicopters got lost and never found the battlefield, while others were unable to land due to mortar fire. Those that successfully landed on target destroyed Egyptian artillery and ammunition dumps and separated gun crews from their batteries, sowing enough confusion to significantly reduce Egyptian artillery fire. Egyptian reinforcements from Jabal Libni advanced towards Um-Katef to counterattack, but failed to reach their objective, being subjected to heavy air attacks and encountering Israeli lodgements on the roads. Egyptian commanders then called in artillery attacks on their own positions. The Israelis accomplished and sometimes exceeded their overall plan, and had largely succeeded by the following day. The Egyptians took heavy casualties, while the Israelis lost 40 dead and 140 wounded. Further south, on 5 June, the 8th Armored Brigade under Colonel Albert Mandler, initially positioned as a ruse to draw off Egyptian forces from the real invasion routes, attacked the fortified bunkers at Kuntilla, a strategically valuable position whose capture would enable Mandler to block reinforcements from reaching Um-Katef and to join Sharon's upcoming attack on Nakhl. The defending Egyptian battalion, outnumbered and outgunned, fiercely resisted the attack, hitting a number of Israeli tanks. However, most of the defenders were killed, and only three Egyptian tanks, one of them damaged, survived. By nightfall, Mendler's forces had taken Kuntilla. By sunset, the Israelis had taken the strategically vital Ali Muntar ridge, overlooking Gaza City, but were beaten back from the city itself. Some 70 Israelis were killed, along with Israeli journalist Ben Oyserman and American journalist Paul Schutzer. Twelve members of UNEF were also killed. On the war's second day, 6 June, the Israelis were bolstered by the 35th Paratroopers Brigade under Colonel Rafael Eitan, and took Gaza City along with the entire Strip. The fighting was fierce, and accounted for nearly half of all Israeli casualties on the southern front. However, Gaza rapidly fell to the Israelis. Meanwhile, on 6 June, two Israeli reserve brigades under Yoffe, each equipped with 100 tanks, penetrated the Sinai south of Tal's division and north of Sharon's, capturing the road junctions of Abu Ageila, Bir Lahfan, and Arish, taking all of them before midnight. Two Egyptian armoured brigades counterattacked, and a fierce battle took place until the following morning. The Egyptians were beaten back by fierce resistance coupled with airstrikes, sustaining heavy tank losses. They fled west towards Jabal Libni. Many of the Egyptian units remained intact and could have tried to prevent the Israelis from reaching the Suez Canal, or engaged in combat in the attempt to reach the canal. However, when the Egyptian Field Marshal Abdel Hakim Amer heard about the fall of Abu-Ageila, he panicked and ordered all units in the Sinai to retreat. This order effectively meant the defeat of Egypt. Meanwhile, President Nasser, having learned of the results of the Israeli air strikes, decided together with Field Marshal Amer to order a general retreat from the Sinai within 24 hours. No detailed instructions were given concerning the manner and sequence of withdrawal. Newsreel from 6 June about the first Israeli-Egyptian fighting. An Israeli gunboat passes through the Straits of Tiran near Sharm El Sheikh. Therefore, in the following two days ( 6 and 7 June), all three Israeli divisions (Sharon and Tal were reinforced by an armoured brigade each) rushed westwards and reached the passes. Sharon's division first went southward then westward, via An-Nakhl, to Mitla Pass with air support. It was joined there by parts of Yoffe's division, while its other units blocked the Gidi Pass. These passes became killing grounds for the Egyptians, who ran right into waiting Israeli positions and suffered heavy losses. According to Egyptian diplomat Mahmoud Riad, 10,000 men were killed in one day alone, and many others died from hunger and thirst. Tal's units stopped at various points to the length of the Suez Canal. Israel's blocking action was partially successful. Only the Gidi pass was captured before the Egyptians approached it, but at other places, Egyptian units managed to pass through and cross the canal to safety. Due to the haste of the Egyptian retreat, soldiers often abandoned weapons, military equipment, and hundreds of vehicles. Many Egyptian soldiers were cut off from their units had to walk about 200 kilometers on foot before reaching the Suez Canal with limited supplies of food and water and were exposed to intense heat. Thousands of soldiers died as a result. Many Egyptian soldiers chose instead to surrender to the Israelis. However, the Israelis eventually exceeded their capabilities to provide for prisoners. As a result, they began directing soldiers towards the Suez Canal and only taking prisoner high-ranking officers, who were expected to be exchanged for captured Israeli pilots. According to some accounts, during the Egyptian retreat from the Sinai, a unit of Soviet Marines based on a Soviet warship in Port Said at the time came ashore and attempted to cross the Suez Canal eastward. The Soviet force was reportedly decimated by an Israeli air attack and lost 17 dead and 34 wounded. Among the wounded was the commander, Lt. Col. Victor Shevchenko. During the offensive, the Israeli Navy landed six combat divers from the Shayetet 13 naval commando unit to infiltrate Alexandria harbour. The divers sank an Egyptian minesweeper before being taken prisoner. Shayetet 13 commandos also infiltrated into Port Said harbour, but found no ships there. A planned commando raid against the Syrian Navy never materialized. Both Egyptian and Israeli warships made movements at sea to intimidate the other side throughout the war, but did not engage each other. However, Israeli warships and aircraft did hunt for Egyptian submarines throughout the war. On 7 June, Israel began the conquest of Sharm el-Sheikh. The Israeli Navy started the operation with a probe of Egyptian naval defenses. An aerial reconnaissance flight found that the area was less defended than originally thought. At about 4:30 am, three Israeli missile boats opened fire on Egyptian shore batteries, while paratroopers and commandos boarded helicopters and Nord Noratlas transport planes for an assault on Al-Tur, as Chief of Staff Rabin was convinced it was too risky to land them directly in Sharm el-Sheikh. However, the city had been largely abandoned the day before, and reports from air and naval forces finally convinced Rabin to divert the aircraft to Sharm el-Sheikh. There, the Israelis engaged in a pitched battle with the Egyptians and took the city, killing 20 Egyptian soldiers and taking 8 prisoner. At 12:15 pm, Defense Minister Dayan announced that the Straits of Tiran constituted an international waterway open to all ships without restriction. On 8 June, Israel completed the capture of the Sinai by sending infantry units to Ras Sudar on the western coast of the peninsula. The Jordan salient, 5–7 June. One of the Jordanian brigades stationed in the West Bank was sent to the Hebron area in order to link with the Egyptians. Intermittent machine-gun exchanges began taking place in Jerusalem at 9:30 am, and the fighting gradually escalated as the Jordanians introduced mortar and recoilless rifle fire. Under the orders from General Narkis, the Israelis responded only with small-arms fire, firing in a flat trajectory to avoid hitting civilians, holy sites or the Old City. At 10:00 am on 5 June, the Jordanian Army began shelling Israel. Two batteries of 155 mm Long Tom cannons opened fire on the suburbs of Tel Aviv and Ramat David Airbase. The commanders of these batteries were instructed to lay a two-hour barrage against military and civilian settlements in central Israel. Some shells hit the outskirts of Tel Aviv. At 11:50 am, sixteen Jordanian Hawker Hunters attacked Netanya, Kfar Sirkin and Kfar Saba, killing one civilian, wounding seven and destroying a transport plane. Three Iraqi Hawker Hunters strafed civilian settlements in the Jezreel Valley, and an Iraqi Tupolev Tu-16 attacked Afula, and was shot down near the Megiddo airfield. The attack caused minimal material damage, hitting only a senior citizens' home and several chicken coops, but sixteen Israeli soldiers were killed, most of them when the Tupolev crashed. During the late afternoon of 5 June, the Israelis launched an offensive to encircle Jerusalem, which lasted into the following day. During the night, they were supported by intense tank, artillery and mortar fire to soften up Jordanian positions. Searchlights placed atop the Labor Federation building, then the tallest in Israeli Jerusalem, exposed and blinded the Jordanians. The Jerusalem Brigade moved south of Jerusalem, while the mechanized Harel Brigade and 55th Paratroopers Brigade under Mordechai Gur encircled it from the north. 1. A political decision to cease fighting to be imposed by a third party (the USA, the Soviet Union or the Security Council). 2. To vacate the West Bank tonight. 3. To go on fighting for one more day, resulting in the isolation and destruction of the entire Jordanian Army. King Hussein has asked me to refer this matter to you for an immediate reply." An Egyptian order for Jordanian forces to withdraw across the Jordan River was issued at 10am on June 6; however that afternoon King Hussein learned of the impending United Nations Security Council Resolution 233 and decided instead to hold out in the hope that a ceasefire would be implemented soon. It was already too late, as the counter-order caused confusion and in many cases it was not possible to regain positions which had previously been left. On 7 June, Dayan had ordered his troops not to enter the Old City; however, upon hearing that the UN was about to declare a ceasefire, he changed his mind, and without cabinet clearance, decided to capture it. Two paratroop battalions attacked Augusta-Victoria Hill, high ground overlooking the Old City from the east. One battalion attacked from Mount Scopus, and another attacked from the valley between it and the Old City. Another paratroop battalion, personally led by Gur, broke into the Old City, and was joined by the other two battalions after their missions were complete. The paratroopers met little resistance. The fighting was conducted solely by the paratroopers; the Israelis did not use armour during the battle out of fear of severe damage to the Old City. On 7 June, Israeli forces seized Bethlehem, taking the city after a brief battle that left some 40 Jordanian soldiers dead, with the remainder fleeing. 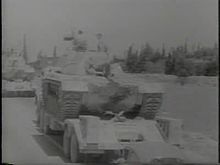 On the same day, one of Peled's brigades seized Nablus; then it joined one of Central Command's armoured brigades to fight the Jordanian forces; as the Jordanians held the advantage of superior equipment and were equal in numbers to the Israelis. As Israel continued its offensive on 7 June, taking no account of the UN ceasefire resolution, the Egyptian-Jordanian command ordered a full Jordanian withdrawal for the second time, in order to avoid an annihilation of the Jordanian army. This was complete by nightfall on 7 June. The Battle of Golan Heights, 9–10 June. 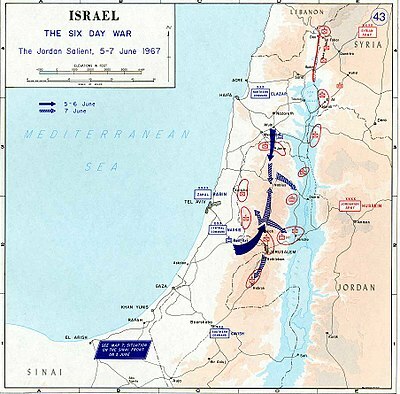 In May–June 1967, in preparation for conflict, the Israeli government planned to confine the confrontation to the Egyptian front, whilst taking into account the possibility of some fighting on the Syrian front. Syria largely stayed out of the conflict for the first four days. False Egyptian reports of a crushing victory against the Israeli army and forecasts that Egyptian forces would soon be attacking Tel Aviv influenced Syria's decision to enter the war – in a sporadic manner – during this period. Syrian artillery began shelling northern Israel, and twelve Syrian jets attacked Israeli settlements in the Galilee. Israeli fighter jets intercepted the Syrian aircraft, shooting down three and driving off the rest. 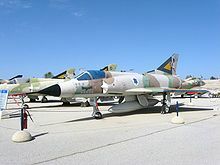 In addition, two Lebanese Hawker Hunter jets, two of the twelve Lebanon had, crossed into Israeli airspace and began strafing Israeli positions in the Galilee. They were intercepted by Israeli fighter jets, and one was shot down. On the evening of 5 June, the Israeli Air Force attacked Syrian airfields. The Syrian Air Force lost some 32 MiG 21s, 23 MiG-15 and MiG-17 fighters, and two Ilyushin Il-28 bombers, two-thirds of its fighting strength. The Syrian aircraft that survived the attack retreated to distant bases and played no further role in the war. Following the attack, Syria realised that the news it had received from Egypt of the near-total destruction of the Israeli military could not have been true. On June 6, a minor Syrian force tried to capture the water plants at Tel Dan (the subject of a fierce escalation two years earlier), Dan, and She'ar Yashuv. These attacks were repulsed with the loss of twenty soldiers and seven tanks. An Israeli officer was also killed. But a broader Syrian offensive quickly failed. Syrian reserve units were broken up by Israeli air attacks, and several tanks were reported to have sunk in the Jordan River. Our forces did not go on the offensive either because they did not arrive or were not wholly prepared or because they could not find shelter from the enemy's planes. The reserves could not withstand the air attacks; they dispersed after their morale plummeted. The Syrians bombarded Israeli civilian settlements in the Galilee Panhandle, by two battalions of M-46 130mm guns, four companies of heavy mortars, and dug-in Panzer IV tanks. The Syrian bombardment killed two civilians, hit 205 houses as well as farming installations. An inaccurate report from a Syrian officer, however, said that as a result of the bombardment that "the enemy appears to have suffered heavy losses and is retreating". On 7 and 8 June, the Israeli leadership debated about whether to attack the Golan Heights as well. Syria had supported pre-war raids that had helped raise tensions and had routinely shelled Israel from the Heights, so some Israeli leaders wanted to see Syria punished. Military opinion was that the attack would be extremely costly, since it would entail an uphill battle against a strongly fortified enemy. The western side of the Golan Heights consists of a rock escarpment that rises 500 meters (1,700 ft) from the Sea of Galilee and the Jordan River, and then flattens to a gently sloping plateau. Dayan opposed the operation bitterly at first, believing such an undertaking would result in losses of 30,000 and might trigger Soviet intervention. Prime Minister Eshkol, on the other hand, was more open to the possibility, as was the head of the Northern Command, David Elazar, whose unbridled enthusiasm for and confidence in the operation may have eroded Dayan's reluctance. Eventually, the situation on the Southern and Central fronts cleared up, intelligence estimated that the likelihood of Soviet intervention had been reduced, reconnaissance showed some Syrian defenses in the Golan region collapsing, and an intercepted cable revealed that Nasser was urging the President of Syria to immediately accept a cease-fire. At 3 am on 9 June, Syria announced its acceptance of the cease-fire. Despite this announcement, Dayan became more enthusiastic about the idea and four hours later at 7 am, "gave the order to go into action against Syria"[i] without consultation or government authorisation. As opposed to all the other campaigns, IAF was only partially effective in the Golan because the fixed fortifications were so effective. However, the Syrian forces proved unable to put up effective defense largely because the officers were poor leaders and treated their soldiers badly; often officers would retreat from danger, leaving their men confused and ineffective. The Israelis also had the upper hand during close combat that took place in the numerous Syrian bunkers along the Golan Heights, as they were armed with the Uzi, a submachine gun designed for close combat, while Syrian soldiers were armed with the heavier AK-47 assault rifle, designed for combat in more open areas. On the morning of 9 June, Israeli jets began carrying out dozens of sorties against Syrian positions from Mount Hermon to Tawfiq, using rockets salvaged from captured Egyptian stocks. The airstrikes knocked out artillery batteries and storehouses and forced transport columns off the roads. The Syrians suffered heavy casualties and a drop in morale, with a number of senior officers and troops deserting. The attacks also provided time as Israeli forces cleared paths through Syrian minefields. However, the airstrikes did not seriously damage the Syrians' bunkers and trench systems, and the bulk of Syrian forces on the Golan remained in their positions. Universal Newsreel from 9 June about the war and UN reactions. By the evening of 9 June, the four Israeli brigades had all broken through to the plateau, where they could be reinforced and replaced. Thousands of reinforcements began reaching the front, those tanks and half-tracks that had survived the previous day's fighting were refueled and replenished with ammunition, and the wounded were evacuated. By dawn, the Israelis had eight brigades in the sector. Syria's first line of defense had been shattered, but the defenses beyond that remained largely intact. Mount Hermon and the Banias in the north, and the entire sector between Tawfiq and Customs House Road in the south remained in Syrian hands. In a meeting early on the night of 9 June, Syrian leaders decided to reinforce those positions as quickly as possible, and to maintain a steady barrage on Israeli civilian settlements. On the next day, 10 June, the central and northern groups joined in a pincer movement on the plateau, but that fell mainly on empty territory as the Syrian forces retreated. At 8:30 am, the Syrians began blowing up their own bunkers, burning documents and retreating. Several units joined by Elad Peled's troops climbed to the Golan from the south, only to find the positions mostly empty. When the 8th Brigade reached Mansura, five miles from Wasit, the Israelis met no opposition and found abandoned equipment, including tanks, in perfect working condition. In the fortified Banias village, Golani Brigade troops found only several Syrian soldiers chained to their positions. A week ago, the fateful campaign began. The existence of the State of Israel hung in the balance, the hopes of generations, and the vision that was realised in our own time... During the fighting, our forces destroyed about 450 enemy planes and hundreds of tanks. The enemy forces were decisively defeated in battles. Many fled for their lives or were captured. For the first time since the establishment of the state, the threat to our security has been removed at once from the Sinai Peninsula, the Gaza Strip, Jerusalem, the West Bank and the northern border. By 10 June, Israel had completed its final offensive in the Golan Heights, and a ceasefire was signed the day after. Israel had seized the Gaza Strip, the Sinai Peninsula, the West Bank of the Jordan River (including East Jerusalem), and the Golan Heights. About one million Arabs were placed under Israel's direct control in the newly captured territories. Israel's strategic depth grew to at least 300 kilometers in the south, 60 kilometers in the east, and 20 kilometers of extremely rugged terrain in the north, a security asset that would prove useful in the Yom Kippur War six years later. Between 776 and 983 Israelis were killed and 4,517 were wounded. Fifteen Israeli soldiers were captured. Arab casualties were far greater. Between 9,800 and 15,000 Egyptian soldiers were listed as killed or missing in action. An additional 4,338 Egyptian soldiers were captured. Jordanian losses are estimated to be 700 killed in action with another 2,500 wounded. The Syrians were estimated to have sustained between 1,000 and 2,500 killed in action. Between 367 and 591 Syrians were captured. On 8 June 1967, USS Liberty, a United States Navy electronic intelligence vessel sailing 13 nautical miles (24 km) off Arish (just outside Egypt's territorial waters), was attacked by Israeli jets and torpedo boats, nearly sinking the ship, killing 34 sailors and wounding 171. Israel said the attack was a case of mistaken identity, and that the ship had been misidentified as the Egyptian vessel El Quseir. Israel apologized for the mistake, and paid compensation to the victims or their families, and to the United States for damage to the ship. After an investigation, the U.S. accepted the explanation that the incident was friendly fire and the issue was closed by the exchange of diplomatic notes in 1987. Others however, including the then United States Secretary of State Dean Rusk, Chief of Naval Operations at the time, Admiral Thomas Moorer, some survivors of the attack and intelligence officials familiar with transcripts of intercepted signals on the day, have rejected these conclusions as unsatisfactory and maintain that the attack was made in the knowledge that the ship was American. The political importance of the 1967 War was immense. Israel demonstrated again that it was able and willing to initiate strategic strikes that could change the regional balance. Egypt and Syria learned tactical lessons and would launch an attack in 1973 in an attempt to reclaim their lost territory. After following other Arab nations in declaring war, Mauritania remained in a declared state of war with Israel until about 1999. The United States imposed an embargo on new arms agreements to all Middle East countries, including Israel. The embargo remained in force until the end of the year, despite urgent Israeli requests to lift it. Following the war, Israel experienced a wave of national euphoria, and the press praised the military's performance for weeks afterward. New "victory coins" were minted to celebrate. In addition, the world's interest in Israel grew, and the country's economy, which had been in crisis before the war, flourished due to an influx of tourists and donations, as well as the extraction of oil from the Sinai's wells. The aftermath of the war also saw a baby boom, which lasted for four years. The aftermath of the war is also of religious significance. Under Jordanian rule, Jews were expelled from Jerusalem and were effectively barred from visiting the Western Wall, despite Article VIII of the 1949 Armistice Agreement demanded Israeli Jewish access to the Western Wall. Jewish holy sites were not maintained, and Jewish cemeteries had been desecrated. After the annexation to Israel, each religious group was granted administration over its holy sites. For the first time since 1948, Jews could visit the Old City of Jerusalem and pray at the Western Wall, the holiest site where Jews are permitted to pray, an event celebrated every year during Yom Yerushalayim. Despite the Temple Mount being the most important holy site in Jewish tradition, the al-Aqsa Mosque has been under sole administration of the Jordanian Muslim Waqf, and Jews are barred from praying on the Temple Mount, although they are allowed to visit it. In Hebron, Jews gained access to the Cave of the Patriarchs – the second most holy site in Judaism, after the Temple Mount – for the first time since the 14th century (previously Jews were allowed to pray only at the entrance). Other Jewish holy sites, such as Rachel's Tomb in Bethlehem and Joseph's Tomb in Nablus, also became accessible. The war inspired the Jewish diaspora, which was swept up in overwhelming support for Israel. According to Michael Oren, the war enabled American Jews to "walk with their backs straight and flex their political muscle as never before. American Jewish organizations which had previously kept Israel at arms length suddenly proclaimed their Zionism." Thousands of Jewish immigrants arrived from Western countries such as the United States, United Kingdom, Canada, France, and South Africa after the war. Many of them returned to their countries of origin after a few years; one survey found that 58% of American Jews who immigrated to Israel between 1961 and 1972 returned to the US. Nevertheless, this immigration to Israel of Jews from Western countries, which was previously only a trickle, was a significant force for the first time. Most notably, the war stirred Zionist passions among Jews in the Soviet Union, who had by that time been forcibly assimilated. Many Soviet Jews subsequently applied for exit visas and began protesting for their right to immigrate to Israel. Following diplomatic pressure from the West, the Soviet government began granting exit visas to Jews in growing numbers. From 1970 to 1988, some 291,000 Soviet Jews were granted exit visas, of whom 165,000 immigrated to Israel and 126,000 immigrated to the United States. The great rise in Jewish pride in the wake of Israel's victory also fueled the beginnings of the baal teshuva movement. The war gave impetus to a Chabad campaign in which the Lubavitcher Rebbe directed his followers to put tefillin on Jewish men around world. The 19 June Israeli cabinet decision did not include the Gaza Strip, and left open the possibility of Israel permanently acquiring parts of the West Bank. On 25–27 June, Israel incorporated East Jerusalem together with areas of the West Bank to the north and south into Jerusalem's new municipal boundaries. In September, the Khartoum Arab Summit resolved that there would be "no peace, no recognition and no negotiation with Israel". However, as Avraham Sela notes, the Khartoum conference effectively marked a shift in the perception of the conflict by the Arab states away from one centered on the question of Israel's legitimacy, toward one focusing on territories and boundaries. This was shown on 22 November when Egypt and Jordan accepted United Nations Security Council Resolution 242. Nasser forestalled any movement toward direct negotiations with Israel. In dozens of speeches and statements, Nasser posited the equation that any direct peace talks with Israel were tantamount to surrender. After the war, the entire Soviet bloc of Eastern Europe (with the exception of Romania) broke off diplomatic relations with Israel. On 22 November 1967, the United Nations Security Council adopted Resolution 242, the "land for peace" formula, which called for Israeli withdrawal "from territories occupied" in 1967 and "the termination of all claims or states of belligerency". Resolution 242 recognized the right of "every state in the area to live in peace within secure and recognized boundaries free from threats or acts of force." Israel returned the Sinai to Egypt in 1978, after the Camp David Accords, and disengaged from the Gaza Strip in the summer of 2005. Its army frequently re-enters Gaza for military operations and still retains control of the seaports, airports and most of the border crossings. 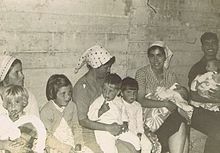 There was extensive displacement of populations in the occupied territories: of about one million Palestinians in the West Bank and Gaza, 300,000 (according to the United States Department of State) either fled, or were displaced from their homes, to Jordan, where they contributed to the growing unrest. The other 700,000 remained. In the Golan Heights, an estimated 80,000 Syrians fled. Israel allowed only the inhabitants of East Jerusalem and the Golan Heights to receive full Israeli citizenship, applying its law, administration and jurisdiction to these territories in 1967 and 1981, respectively. The vast majority of the populations in both territories declined to take citizenship. See also Israeli–Palestinian conflict and Golan Heights. Israel made peace with Egypt following the Camp David Accords of 1978 and completed a staged withdrawal from the Sinai in 1982. However, the position of the other occupied territories has been a long-standing and bitter cause of conflict for decades between Israel and the Palestinians, and the Arab world in general. Jordan and Egypt eventually withdrew their claims to sovereignty over the West Bank and Gaza, respectively. Israel and Jordan signed a peace treaty in 1994. After the Israeli occupation of these territories, the Gush Emunim movement launched a large settlement effort in these areas to secure a permanent foothold. There are now hundreds of thousands of Israeli settlers in the West Bank. They are a matter of controversy within Israel, both among the general population and within different political administrations, supporting them to varying degrees. Palestinians consider them a provocation. The Israeli settlements in Gaza were evacuated in August 2005 as a part of Israel's disengagement from Gaza. [At Security Council meeting of 5 June], both Israel and Egypt claimed to be repelling an invasion by the other. Bailey 1990, p. 225. "Egyptian sources claimed that Israel had initiated hostilities [...] but Israeli officials – Eban and Evron – swore that Egypt had fired first" Oren 2002, p. 196. Israel clearly did not want the US government to know too much about its dispositions for attacking Syria, initially planned for June 8, but postponed for 24 hours. It should be pointed out that the attack on the Liberty occurred on June 8, whereas on June 9 at 3 am, Syria announced its acceptance of the cease-fire. Despite this, at 7 am, that is, four hours later, Israel's minister of defense, Moshe Dayan, "gave the order to go into action against Syria. ^ a b Weill, Sharon (2007). "The judicial arm of the occupation: the Israeli military courts in the occupied territories". International Review of the Red Cross. 89 (866): 401. doi:10.1017/s1816383107001142. ISSN 1816-3831. On 7 June 1967, the day the occupation started, Military Proclamation No. 2 was issued, endowing the area commander with full legislative, executive, and judicial authorities over the West Bank and declaring that the law in force prior to the occupation remained in force as long as it did not contradict new military orders. ^ a b Tucker 2004, p. 176. ^ a b c Griffin 2006, p. 336. ^ a b Israel Ministry of Foreign Affairs 2008. ^ Zaloga, Steven (1981). Armour of the Middle East Wars 1948–78 (Vanguard). Osprey Publishing. ^ a b El Gamasy 1993 p. 79. ^ a b Herzog 1982, p. 165. ^ a b The Six Day War 1967: Jordan and Syria. Simon Dunstan. Bloomsbury Publishing. 20 February 2013. ISBN 9781472801975. Retrieved 6 January 2018. ^ a b Tucker, Spencer C. (2010). The Encyclopedia of Middle East Wars. The United States in the Persian Gulf, Afghanistan, and Iraq Conflicts. ABC-CLIO. p. 1198. ISBN 978-1-85109-947-4. ^ a b Woolf, Alex (2012). Arab–Israeli War Since 1948. Heinemann-Raintree. p. 27. ISBN 978-1-4329-6004-9. ^ a b Sachar, Howard M. (2013). A History of Israel: From the Rise of Zionism to Our Time. Random House. ISBN 978-0-8041-5049-1. ^ Gerhard, William D.; Millington, Henry W. (1981). "Attack on a SIGINT Collector, the USS Liberty" (PDF). NSA History Report, U.S. Cryptologic History series. National Security Agency. partially declassified 1999, 2003. ^ Both USA and Israel officially attributed the USS Liberty incident as being due to mistaken identification. ^ Major General Indar Jit Rikhye (28 October 2013). The Sinai Blunder: Withdrawal of the United Nations Emergency Force Leading... Taylor & Francis. pp. 8–. ISBN 978-1-136-27985-0. ^ Ami Gluska (12 February 2007). The Israeli Military and the Origins of the 1967 War: Government, Armed Forces and Defence Policy 1963–67. Routledge. p. 152. ISBN 978-1-134-16377-9. On the evening of 22 May, President Gamal Abdul Nasser, accompanied by ... Egyptian air force base at Bir Gafgafa in Sinai and addressed the pilots and officers. ... 'The Jews are threatening war – we say to them ahlan wa-sahlan (welcome)! ^ "First United Nations Emergency Force (UNEF I) – Background (Full text)". Rauschning, Wiesbrock & Lailach 1997, p. 30; Sachar 2007, pp. 504, 507–08. ^ Pollack 2004, p. 290. ^ Shemesh, Moshe (2007). Arab Politics, Palestinian Nationalism and the Six Day War: The Crystallization of Arab Strategy and Nasir's Descent to War, 1957–1967. Sussex Academic Press. p. 118. ISBN 978-1-84519-188-7. The Jordanian leadership's appraisal of the repercussions of the Samu' raid was a major factor in King Husayn's decision to join Nasir's war chariot by signing a joint defense pact with Egypt on May 30, 1967. This was the determining factor for Jordan's participation in the war that would soon break out.... Convinced after the Samu' raid that Israel's strategic goal was the West Bank, Husayn allied himself to Nasir out of a genuine fear that, in a comprehensive war, Israel would invade the West Bank whether or not Jordan was an active participant. ^ John Quigley, The Six-Day War and Israeli Self-Defense: Questioning the Legal Basis for Preventive War, Cambridge University Press, 2013, p. 32. ^ Mutawi 2002, p. 93: "Although Eshkol denounced the Egyptians, his response to this development was a model of moderation. His speech on 21 May demanded that Nasser withdraw his forces from Sinai but made no mention of the removal of UNEF from the Straits nor of what Israel would do if they were closed to Israeli shipping. The next day Nasser announced to an astonished world that henceforth the Straits were, indeed, closed to all Israeli ships"
^ "Interference, by armed force, with ships of Israeli flag exercising free and innocent passage in the Gulf of Aqaba and through the Straits of Tiran will be regarded by Israel as an attack entitling it to exercise its inherent right of self-defence under Article 51 of the Charter and to take all such measures as are necessary to ensure the free and innocent passage of its ships in the Gulf and in the Straits." "Statement to the General Assembly by Foreign Minister Meir, 1 March 1957". Israel Ministry of Foreign Affairs – The State of Israel. ^ Morris, Benny (1999). Righteous Victims: A History of the Zionist–Arab Conflict, 1881–1998. Random House. p. 306. ISBN 978-0-679-42120-7. ^ Gat, Moshe (2003). Britain and the Conflict in the Middle East, 1964–1967: The Coming of the Six-Day War. Greenwood Publishing Group. p. 202. ISBN 978-0-275-97514-2. ^ Colonomos, Ariel (2013). The Gamble of War: Is it Possible to Justify Preventive War?. Palgrave Macmillan. p. 25. ISBN 978-1-137-01894-6. ^ "LBJ Pledges U.S. to Peace Effort", Eugene Register-Guard (19 June 1967). See also Johnson, Lyndon. "Address at the State Department's Foreign Policy Conference for Educators" (19 June 1967). ^ Reston, James (24 May 1967). "Washington: Nasser's Reckless Maneuvers; Cairo and Moscow The U.S. Commitment The Staggering Economy Moscow's Role". The New York Times. p. 46. ^ Stone 2004, p. 217. ^ Pollack 2004, p. 294. ^ a b Pollack 2004, p. 59. ^ Ehteshami and Hinnebusch 1997, p. 76. ^ Mutawi 2002, p. 42. ^ a b Segev 1967, pp. 82, 175–91. ^ Pollack 2004, pp. 293–94. ^ "Air Warriors". Pakistan Air Force. Retrieved 15 July 2017. ^ "Eagle Biography – Saiful Azam". Air University. Retrieved 15 July 2017. ^ a b c Quigley, John (2005). The Case for Palestine: An International Law Perspective. London: Duke University Press. p. 163. ISBN 978-0-8223-3539-9. ^ Bowen 2003, p. 99 (author interview with Moredechai Hod, 7 May 2002). ^ a b Oren 2002, electronic edition, Section "The War: Day One, June 5". ^ Bowen 2003, pp. 114–15 (author interview with General Salahadeen Hadidi who presided over the first court martial of the heads of the air force and the air defense system after the war). ^ Oren, 176, says 282 out of 420. Morris, 318, says 304 out of 419. Mark Tessler, A History of the Israeli–Palestinian Conflict (Indiana, 1994), p. 396, says over 350 planes were destroyed. ^ a b "Part 4: The 1967 Six Day War". Retrieved 20 April 2011. ^ "Six Day War". Israeli-weapons. Retrieved 1 February 2012. ^ Leslie Stein,The Making of Modern Israel: 1948–1967, Polity Press, 2013 p. 181. ^ Mubasher, Abdou (7–13 June 2007). "The road to Naksa". Al-Ahram. Retrieved 24 May 2017. ^ Oren 2002, pp. 184–185. ^ "On June 5, Israel sent a message to Hussein urging him not to open fire. Despite shelling into West Jerusalem, Netanya, and the outskirts of Tel Aviv, Israel did nothing." The Six Day War and Its Enduring Legacy. Summary of remarks by Michael Oren at the Washington Institute for Near East Policy, 29 May 2002. ^ Donald Neff (1984). Warriors for Jerusalem: the six days that changed the Middle East. Linden Press/Simon & Schuster. p. 205. ISBN 978-0-671-45485-2. Odd Bull: "[the message] was a threat, pure and simple and it is not the normal practice of the U.N. to pass on threats from one government to another." However, as "…this message seemed so important… we quickly sent it…and King Hussein received the message before 10:30 the same morning." ^ a b Shlaim (2000). The Iron Wall: Israel and the Arab World. pp. 243–244. In May–June 1967 Eshkol's government did everything in its power to confine the confrontation to the Egyptian front. Eshkol and his colleagues took into account the possibility of some fighting on the Syrian front. But they wanted to avoid having a clash with Jordan and the inevitable complications of having to deal with the predominantly Palestinian population of the West Bank. The fighting on the eastern front was initiated by Jordan, not by Israel. King Hussein got carried along by a powerful current of Arab nationalism. On 30 May he flew to Cairo and signed a defense pact with Nasser. On 5 June, Jordan started shelling the Israeli side in Jerusalem. This could have been interpreted either as a salvo to uphold Jordanian honour or as a declaration of war. Eshkol decided to give King Hussein the benefit of the doubt. Through General Odd Bull, the Norwegian commander of UNTSO, he sent the following message the morning of 5 June: "We shall not initiate any action whatsoever against Jordan. However, should Jordan open hostilities, we shall react with all our might, and the king will have to bear the full responsibility of the consequences." King Hussein told General Bull that it was too late; the die was cast. ^ a b c Shlaim, 2001, p. 244. ^ "United Nations June 5, 1967". United Nations. Archived from the original on 26 December 2011. Retrieved 1 February 2012. ^ a b Shlaim 2001, p. 245. ^ "Pacifica Military History – Free Samples". Pacificamilitary.com. 5 June 1967. Retrieved 1 February 2012. ^ a b Mutawi 2002, p. 138. ^ Mutawi 2002, p. 138-139. ^ Mutawi 2002, p. 139. ^ a b Mutawi 2002, p. 140: "Shortly after the order for the withdrawal had been issued [10.00 a.m. on 6 June], the Jordanians were informed that the UN Security Council was meeting to consider a resolution for an unconditional ceasefire. On learning of this the Jordanian command decided that the order for withdrawal had been premature, since if a ceasefire went into effect that day they would still be in possession of the West Bank. Consequently, the order was countermanded and those forces which had already withdrawn were asked to return to their original positions... The Security Council ceasefire resolution was passed unanimously at 11.00 p.m. on 6 June. However, Jordan's hope that this would enable it to hold the West Bank was destroyed when Israel continued its offensive. On learning of this Riad once again ordered a complete withdrawal from the West Bank as he feared that failure to do so would result in the annihilation of the remains of the Jordanian Army. By nightfall on 7 June most elements of the army had withdrawn to the East Bank and by mid-day on 8 June Jordan was once again the Transjordan of King Abdullah, while Israel completed total occupation of historical Palestine." ^ Shlaim 2001, p. 246. ^ a b Shlaim; Louis (2012) pp. 92-93: "Except for some sporadic Syrian shelling of Israeli settlements along the border, Syria stayed pretty much out of the war for the first four days... the Syrians were confused by what they slowly learned was the scale of the destruction on the Egyptian front. They were astounded. They did not understand what was going on, nor did they have the military experience and capability, especially in the officer corps, to react to the new situation. With no air support, how could they move forward against Israel? They reasoned that if they sat tight, they could emerge from this with little damage." ^ a b c Sachar 1976. p. 642. ^ a b Oren 2002, electronic edition, Section "The War: Day Five, June 9". ^ Video: Cease-Fire. Uneasy Truce In Mid-East, 1967/06/13 (1967). Universal Newsreel. 1960. Retrieved 22 February 2012. ^ "Six-Day War – Middle East ". ^ Sachar 1976. p. 660. ^ a b c Oren 2002, electronic edition, Section "Aftershocks". ^ "BBC Panorama". BBC News. 6 February 2009. Retrieved 1 February 2012. ^ "Egypt State Information Service". Sis.gov.eg. Retrieved 1 February 2012. ^ Churchill & Churchill 1967, p. 179. ^ Bron, Gabby 'Egyptian POWs Ordered to Dig Graves, Then Shot By Israeli Army' Archived 19 February 2007 at the Wayback Machine, Yedioth Ahronoth, 17 August 1995. ^ Bar-Zohar, Michael 'The Reactions of Journalists to the Army's Murders of POWs', Maariv, 17 August 1995. ^ Prior 1999, pp. 209–10; Bar-On, Morris and Golani 2002; Fisher, Ronal 'Mass Murder in the 1956 War', Ma'ariv, 8 August 1995. ^ Laub, Karin "Archived copy". Archived from the original on 11 December 2003. Retrieved 11 December 2003. CS1 maint: Archived copy as title (link) CS1 maint: Unfit url (link), Associated Press, 16 August 1995. Retrieved from the Wayback Machine. 14 October 2005. ^ Ibrahim, Youssef (21 September 1995). "Egypt Says Israelis Killed P.O.W. 's in '67 War". The New York Times. ^ Phythian 2001, pp. 193–94. ^ "McNamara: US Near War in '67". The Boston Globe. 16 September 1983. p. 1. ^ John Crewdson (2 October 2007). "New revelations in attack on American spy ship". Chicago Tribune. ^ Tim Fischer, 'Six days of war, 40 years of secrecy,' The Age 27 May 2007. ^ John Quigley, The Six-Day War and Israeli Self-Defense: Questioning the Legal Basis for Preventive War, Cambridge University Press 2013 p. 93. Cf Dean Rusk, As I Saw it: A Secretary of State's Memoirs, W.W. Norton, 1990 pp. 386–88. ^ William B. Quandt (2001). Peace Process: American Diplomacy and the Arab–Israeli Conflict Since 1967. University of California Press. p. 42. ISBN 978-0-520-22374-5. once hostilities were under way, the United states imposed an embargo on new arms agreements to all countries of the Middle East, including Israel. The embargo remained in force through the end of the year, despite urgent Israeli requests to lift it. ^ Reuters (6 March 2007). "HMO Data Show Lebanon War Triggered Baby Boom in Israel" – via Haaretz. ^ "Fact Sheet No. 52, Remembering the Six Day War". 7 May 2007. Archived from the original on 14 May 2008. Retrieved 28 March 2008. ^ Tessler, Mark A. (1994). A History of the Israeli-Palestinian Conflict. Indiana University Press. p. 326. ISBN 978-0-253-35848-6. ^ Aikman, David (1998). Great Souls: Six Who Changed a Century. Lexington Books. p. 349. ISBN 978-0-7391-0438-5. ^ Tom Selwyn. Contested Mediterranean Spaces: The Case of Rachel's Tomb, Bethlehem, Palestine. Berghahn Books. pp. 276–278. ^ "Archaeology in Israel: Joseph's Tomb". ^ "The 40th anniversary of the Six-Day War / Rate of return". Haaretz. 1 June 2007. Retrieved 10 October 2014. ^ "The Miracle of '67: Forty Years Since the Six-Day War (Rabbi Moshe Goldstein) 2007". www.wherewhatwhen.com. Archived from the original on 12 December 2007. ^ "American Jews rediscover orthodoxy". The New York Times. 30 September 1984. Retrieved 9 October 2017. ^ Aiken, Lisa (2009). The Baal Teshuva Survival Guide. Rossi Publications. ISBN 978-0-9779629-3-8. ^ Hundert, Gershon David (1991). Essential Papers on Hasidism. New York University Press. p. 526. ISBN 9780814734704. ^ Heilman, Samuel; Friedman, Menachem (2012). The Rebbe: The Life and Afterlife of Menachem Mendel Schneerson. Princeton University Press. p. 184. ISBN 9780691138886. ^ Ringer, Ronald (2006). Excel HSC Modern History. Pascal Press. p. 390. ISBN 9781741252460. Retrieved 10 September 2013. ^ Communiqué: Investigation regarding communist state officers who publicly incited hatred towards people of different nationality. Institute of National Remembrance, Warsaw. Publication on Polish site of IPN: 25 July 2007. ^ Herzog 1989, p. 253. ^ Shlaim 2001, p. 254. ^ Sela 1997, p. 108. ^ Webman, Esther (2011). The Global Impact of the Protocols of the Elders of Zion: A Century-Old Myth. Routledge. p. 133. ISBN 978-0-415-59892-7. ^ "Right of return: Palestinian dream". UK: BBC News. 15 April 2004. .
^ "Distribution of the Palestinian Population And Jewish Settlers In the West Bank and Gaza Since 1967". Archived from the original on 14 May 2010. Retrieved 17 July 2010. ^ "Golan Heights". Retrieved 8 October 2005. ^ "Al-Qunayṭirah". Encyclopædia Britannica Online. 2010. Retrieved 18 July 2010. Burrowes, Robert & Muzzio, Douglas. (1972). The Road to the Six Day War: Towards an Enumerative History of Four Arab States and Israel, 1965–67. The Journal of Conflict Resolution, Vol. 16, No. 2, Research Perspectives on the Arab–Israeli Conflict: A Symposium, pp. 211–26. Eshkol, Levi (1967). Prime-Minister Levi Eshkol - His words and his writings. ISA-PMO-PrimeMinisterBureau-000d0t9. Israel Government Archives. Retrieved June 6, 2018. Feron, James (13 May 1967). "Israelis Ponder Blow at Syrians; Some Leaders Decide That Force is the Only Way to Curtail Terrorism Some Israeli Leaders See Need for Force to Curb Syrians". The New York Times. Green, Stephen J. (1984). Taking Sides: America's Secret Relations With Militant Israel. William Morrow & Co. ISBN 978-0-688-02643-1. Haddad, Yvonne. (1992). Islamists and the "Problem of Israel": The 1967 Awakening. Middle East Journal, Vol. 46, No. 2, pp. 266–85. Hajjar, Sami G. The Israel-Syria Track, Middle East Policy, Volume VI, February 1999, Number 3. Retrieved 30 September 2006. Hattendorf, John B. (2000). Naval Strategy and Power in the Mediterranean: Past, Present and Future. Taylor & Francis. ISBN 978-0-7146-8054-5. Herbert, Nicholas (17 May 1967). Egyptian Forces On Full Alert: Ready to fight for Syria. The Times, p. 1; Issue 56943; col E.
"Israel Reportedly Killed POWs in '67 War; Historians Say Deaths of Hundreds of Egyptians Was Covered Up Israel Reportedly Killed POWs in '67 War; Historians Say Deaths of Hundreds of Egyptians Was Covered Up", The Washington Post, 17 August 1995, p. A.30 (Fee required). James, Laura (2005). The Nassar And His Enemies: Foreign Policy Decision Making In Egypt On The Eve Of The Six Day War. The Middle East Review of International Affairs. Volume 9, No. 2, Article 2. "Israelis Say Tape Shows Nasser Fabricated 'Plot'; Recording Said to Be of Phone Call to Hussein Gives Plan to Accuse U.S. and Britain". The New York Times. 9 June 1967. p. 17. Retrieved 28 June 2007. Krauthammer, Charles (18 May 2007). "Prelude to the Six Days". The Washington Post. pp. A23. ISSN 0740-5421. Retrieved 20 June 2008. Laron, Guy (21 February 2017). The Six Day War: The Breaking of the Middle East. Yale University Press. ISBN 978-0-300-22632-4. Lenczowski, George. (1990). American Presidents and the Middle East. Duke University Press. ISBN 0-8223-0972-6. Lyndon Baines Johnson Library. (1994). [permanent dead link] Transcript, Robert S. McNamara Oral History[permanent dead link], Special Interview I, 26 March 1993, by Robert Dallek, Internet Copy, LBJ Library. Retrieved 20 July 2010. "McNamara: US Near War in '67". The Boston Globe. 16 September 1983. p. 1. Mutawi, Samir A. (18 July 2002). Jordan in the 1967 War. Cambridge University Press. ISBN 978-0-521-52858-0. Parker, Richard B. (August 1997). "USAF in the Sinai in the 1967 War: Fact or Fiction" (PDF). Journal of Palestine Studies. XXVII (1): 67–75. doi:10.1525/jps.1997.27.1.00p0164l. Podeh, Elie (Winter 2004). "The Lie That Won't Die: Collusion, 1967". Middle East Quarterly. 11 (1). Pollack, Kenneth Michael (2004). Arabs at War: Military Effectiveness, 1948-1991. U of Nebraska Press. ISBN 978-0-8032-0686-1. Pollack, Kenneth Michael (2005). "Air Power in the Six-Day War". The Journal of Strategic Studies. 28 (3): 471–503. doi:10.1080/01402390500137382. Segev, Tom (2005). Israel in 1967. Keter. ISBN 978-965-07-1370-6. Smith, Hedrick (15 June 1967). "As the Shock Wears Off; Arab World, Appraising Its Defeat, Is Split as It Gropes for Strategy". The New York Times. p. 16. Retrieved 28 June 2006. Smith, Hedrick (15 September 1967). "Envoys Say Nasser Now Concedes U.S. Didn't Help Israel". The New York Times. pp. Page 1, Col. 5, Page 3, Col. 1. Tolan, Sandy (4 June 2007). "Rethinking Israel's David-and-Goliath past". Salon.com. Retrieved 29 April 2010. United Nations (967, 5 June). 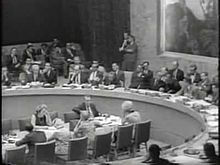 1347 Security Council MEETING : June 5, 1967. Provisional agenda (S/PV.1347/Rev.1). On a subpage of the website of The United Nations Information System on the Question of Palestine (UNISPAL). Youngs, Tim. (2001). Developments in the Middle East Peace Process 1991–2000 London: International Affairs and Defence Section, House of Commons Library. ISSN 1368-8456. Finkelstein, Norman (2003). Image and Reality of the Israel–Palestine Conflict. Verso. ISBN 978-1-85984-442-7. Hammel, Eric (October 2002). "Sinai air strike: June 5, 1967". Military Heritage. 4 (2): 68–73. The Photograph: A Search for June 1967. Retrieved 17 July 2010. UN Resolution 242. Retrieved 17 July 2010. Status of Jerusalem: Legal Aspects. Retrieved 22 July 2014. Position of Arab forces May 1967. Retrieved 22 July 2014.